Action from a Peterborough NECI game. 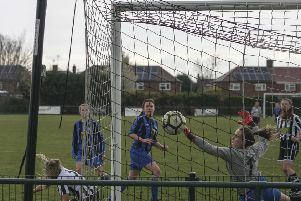 A Northants County Cup tie was abandoned on Saturday (January 6) after a manager refused to leave the field of play. The Area Cup third round tie between Peterborough NECI and Weldon United Reserves was halted after 30 minutes with the score goalless. According to an eye witness the Weldon manager became so irate his team weren’t awarded a corner he invaded the pitch and refused to leave when asked by the referee. The tie was promptly abandoned by the match official who has reported the incident to the Northants Football Association.